Home / The Archives / Bike commuters: You're not alone! Bike commuters: You're not alone! I hope you and others in your situation are helped and encouraged by Commute By Bike. I’m in a bike commute mecca now, but for most of my working life I lived in locations where I was often the only bike commuter I knew. I started in college, where I biked to my night job doing mechanical drawings for an electric utility in Texas. In the summers, my second job was across town at a steakhouse. I rode to work in Texas summer heat, hosed myself down outside next to the dumpster, put my steakhouse uniform on over my lycra bike shorts in the bathroom and got to work. I was the only bike commuter I knew. After I got a “real” office job, I continued my bike commuting that involved 20 miles from north Fort Worth, across the Mid Cities and DFW airport and to my job in Irving, Texas. I was the only regular bike commuter I knew. I then moved to Champaign County, Illinois, where I bike commuted across 20 empty miles of corn and soybean fields to my job. I was the only regular bike commuter that I knew. After that, I lived and worked in Longmont, Colorado. After over a decade of long commutes, I finally figured out that I should live close to my work. This was also the first time in my life that I saw bicycle lanes and other facilities for cyclists. Not only that, I also saw other bike commuters for the first time in my life. I’m now in California, where I’ve discovered another bonus: I’m not “weird” because I wear regular clothes on my commute. 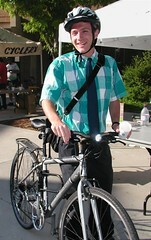 Many of the thousands of regular bike commuters in the Bay Area are computer geeks going to their jobs, just like me. I’ve heard it said that engineers commute by bike as an exercise in cost optimization. I do it because I simply like to be moving and outdoors, which the bike commute gives me opportunity to do. Whatever your reasons, be reminded that you’re not alone! But in many cities in the U.S., such support isn’t always available. One of my goals for this blog is to encourage those isolated bike commuters scattered around the country in smaller communities, who may feel alone in their daily conflict with vehicle traffic. In addition to providing “how to” information, I hope this blog helps to illustrate that bicycling commuters are not alone, but are part of a healthy and growing movement. I enjoy these sites also, for the same reason as Paul. I’ve been commuting for a little over a year from north Fort Worth to the middle of DFW Airport, and in that time have seen exactly 2 other bike commuters. I ride an electric-assist bike (sorry, but 36 mi/day is more than I want to do these days). The bike is a cluttered mess, with wires and batteries all over that make it look like something from a Homeland Security training manual. I’m also a total Fred, even to the point of wearing an orange construction-worker type vest for that little extra bit of dorkiness. I’m an engineer, and can say that cost optimization has very little to do with my own bike riding. I just get real energy-geek enjoyment out of getting around on human power plus 17 Watt-hours/mile of electricity. But I do look forward to the day when more “normal” people will also take to the streets on bicycles. You know what? Ultimately, it’s also one of the reasons I blog about my commute. I’m just a normal, out-of-shape (but not for too much longer) guy that likes to ride my bike while saving money and losing weight. To me, being able to say I’m doing a small part to make the world a better place (less polluted, less crowded parking lots and highways, etc) is a fringe benefit. Regardless, I am still the only one I see who uses a bike pretty much daily for my every day tasks. I know others are out here. I talk to them via email. I see some of my commuter friends on occasion, but not daily. Co-workers think I am insane, eccentric, or just plain stupid. I have a hint that some of them think perhaps I’ve lost my license or wrecked my car, but use this “macho” bike thing to cover it up. The truth is, I really don’t need to use my car all that often, especially for quick runs to the store or to the bus stop. I say the more of us that are out there fighting the good fight and living to write about it, the better! Well hello guys and girls from US, I’m a commuter (2-3 times a week) from Switzerland. I have a 20 kms ride one-way to work with a 7kms uphill to start with and then I’m flowing through countryside, cows, tall grasses, fields and small villages. It’s a great ride, with views over the Jura mountains and the Alps. I’m most of the time all alone on small roads, almost NO traffic! I am a real lucky commuter but I must admit sometimes I felt a bit strange, thinking, what the f… am I doing out here, when one day I found this site and, yes, it does give me a feeling of belonging to a community, even though you all seem to be over in the US! So thanks to you all, ride on, and if I get to take along my camera one day I will post a few photos of my rides! I live and commute in Chicago and I work at a trading firm filled with people who drive giant cars, live in the suburbs and all that crap. I started biking to work and they thought it was strange. Playing on their ‘political sensibilities,’ I simply said that I’m saving tons of cash in gas and doing my part to break our dependence on foreign oil. That really convinced them, now two coworkers are dusting off their bikes, and another is biking part way to work as well. If you get flack from your coworkers, couch your reasons for commuting in terms they can understand and agree with. Paul I feel ya’ on the heat. Its starting to heat up Here in North Carolina, and It hasn’t rained in weeks. I live in Monroe and commute to the Matthews area on the southeast end of Charlotte, usually around 11 miles one way. People stare, people honk, people throw single fingered gestures. We dont have any bike lanes and it drives me crazy. With both of the cars we own being V8 engines and the increase in gas prices I’ve had to commit to a promise I made a few years back when I told myself I would park the car and ride everywhere I could. I’m not really set up for commuting, I ride a full carbon road bike in all the tights and a messenger bag for my clothes and lunch. It has been awkward the last few weeks walking into work in the tights but It has really sparked everyones interest. Even the local news crew came and videoed me for part of a going green segment. Usually I don’t see any other commuters in my end of town, but surprisingly I saw 5 on the way home yesterday and that made me feel good. dears, I am from Taiwan and also a bike commuter, a photo group on Flickr just create by named : Bike to work in Taiwan. (http://www.flickr.com/groups/385369@N21/) , please feel free to join us and have fun. Hey fellow bike commuters, I bet you are enjoying your bikes much more when you look at the Memorial day weekend gas price gouging. I live in Kalamazoo, Michigan and gas prices just jumped to $3.65/ gallon. Last year the price was $1 cheaper and I thought that was high! I’ve been commuting since the snow has melted in March/April. I just got one of those electric conversion bike kits and have made my commute that much more fun. The hub motor is virtually silent and can carry me 20-25 mph for my 10 mile one way commute. My ride is mostly in the country and the silence is appreciated greatly by me. I put this kit on a cheap old Schwinn mountain bike that was collecting dust for years and I have already logged 700 miles on it. I still pedal along with the motor. If I have a good stiff breeze behind me, I can actually have difficuly keeping up with the motor while I am in my top gear. It’s nice when I arrive at work not totally drenched in my own sweat! If I was to do the same trip on my road bike I could count on needing a shower at work. Unfortunately now my “new” road bike is collecting dust. I’ve been commuting by bike in New Jersey for a year now, yesterday I saw 2 bike commuters! A few months ago I saw 1 bike commuter. In the winter it is easier to track the elusive “bicyclius commuticus” because their tracks can bee seen in the sno, then I saw evidence of another. Mostly my coworkers think I’m crazy/broke/deathwish/alloftheabove… I’ve tried statistics (I read then researched that you’re 4x as likely to die in a swimming pool than biking) but that doesn’t make ’em stop questioning my sanity. I’ll try the environmental activist approach next. My biggest revelation recently, and this might be like what a Master of the obvious I now am, but I have always used side walks when convenient, have seldom scared pedestrians, except for the ‘bobbing nabobs,’ and now realize that street riding is the only way to garner respect from cars, get anywhere, and even avoid police hassles. I feel your pain! So much so, in fact, that I started a local bike commuting group (see website). Maybe some of you would like to do the same. It’s helped me meet a lot of other bike commuters. (That and joining my local bike/ped advocacy committee.) Have fun, ride safe! Last year marked the 10th anniversary of me having a desk job. Coincidentally I started packing on a few extra pounds. Seeing as I used to bike everywhere and have a decent bike and I only live 4.6 miles from work… commute time becomes exercise time. Plus I’m doing something environmentally sound and saving some wear-and-tear on my car so it should last a bit longer. Today is the 12th time I’ve pedaled in in the last 6 weeks. I set a goal of 500 miles on the bike this year so I added a cyclometer when I started — this week I’ll hit 200. I’ve definitely picked up a few tips from here and elsewhere, but knowing I’m not alone is the best benefit. With the rising gas prices I’ve actually encountered 3 other commuters here in NE Indianapolis! Through Tour de Cure and Bike To Work Day I’ve also met up with some other cyclists at work who have MUCH longer commutes than me but are going to be making it a more regular thing. Keep the faith all… You’re not alone! Cyclist beats car and bus in commuting race… does it matter?